The Galápagos Islands have long offered researchers a natural laboratory in which to study unique volcanic features and a diverse population of native plants and animals. Although the creatures and islands have been well documented since Charles Darwin’s revolutionary research in the 19th century, there’s still much to be discovered beneath the waters that surround the remote Pacific Ocean island chain. The Galápagos archipelago, which is made up of 13 major volcanic islands, occupies a submerged platform, which rises more than 3 kilometers above the adjacent seafloor. 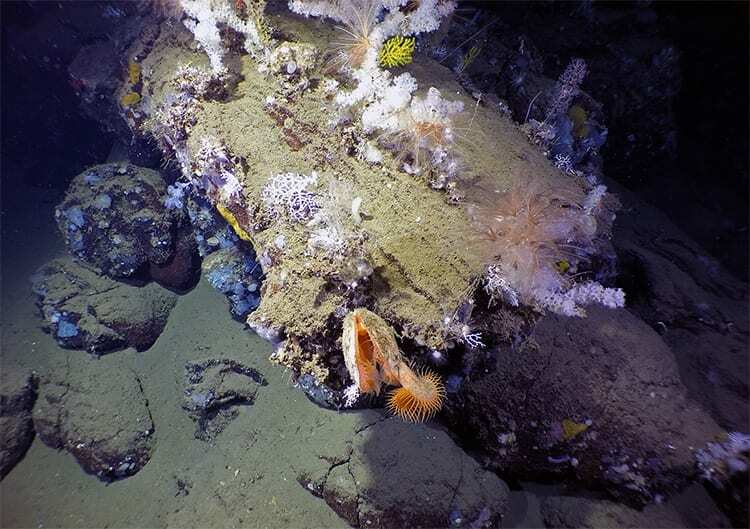 Until recently, the platform and the surrounding deep-water seamounts had not been explored using modern, high-resolution survey and sampling methods. During a three-week expedition in August, an international team led by the Woods Hole Oceanographic Institution (WHOI), in partnership with the Charles Darwin Foundation for the Galápagos Islands and in close collaboration with the Galapagos National Park Directorate, conducted the first scientific expedition to map and characterize the seamounts on the Galápagos platform and the diverse marine life that these underwater mountains support. With the support of the Dalio Ocean Initiative, the research team, which also included scientists from Boise State University, University of California-Berkeley, the Charles Darwin Foundation, the Instituto Oceanográfico de la Armada del Ecuador (INOCAR), and representatives from the Galápagos National Park Directorate, worked from aboard the M/V Alucia in the central and western portions of the archipelago around the islands of Santiago, Santa Cruz, Floreana and Fernandina. For mapping and surveying, the team utilized a multibeam sonar mounted on Alucia’s hull and a side-scan sonar on the WHOI-designed autonomous underwater vehicle (AUV), REMUS 600. High-resolution photographic surveys were conducted with the WHOI-MISO TowCam deep-towed camera sled system. 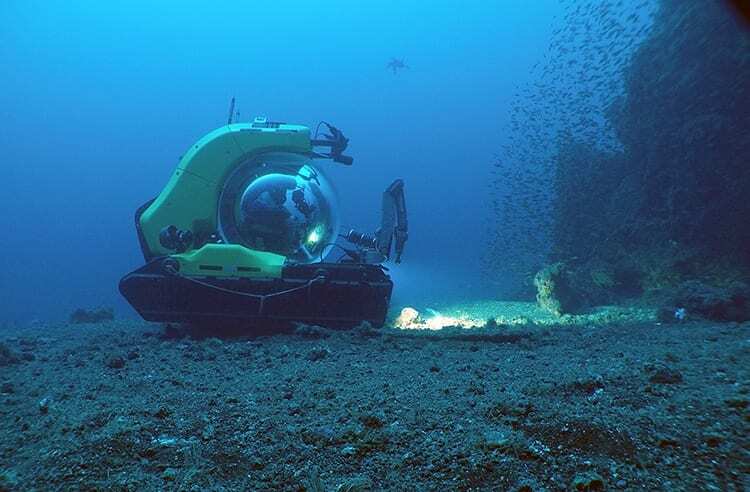 These surveys helped guide dives using the Alucia’s two manned submersibles—Deep Rover 2 and Nadir—to collect geological and biological samples. The high-resolution mapping revealed over 70 seamounts—many of which were not previously known. During the submersible dives, more than 150 rock samples and 300 biological samples were collected and catalogued. The research team is currently analyzing data collected during the expedition. Preliminary observations support the idea that the seamounts were emergent in the past during a period of low sea level corresponding to the last ice age about 26,000 years ago, and also points to a potential link between sea level decreases and increased eruption rates. Soule says these results could have implications regarding the evolution and past movements of animals between the islands. A key scientific objective of this study is to understand the magmatic processes on the Galápagos Platform, which is currently based almost exclusively on samples from the volcanoes collected on land. “We will be conducting geochemical analyses on the samples to determine the link between the volcanic systems below and above the waterline,” added Dorsey Wanless, an Assistant Professor at Boise State University and co-principal investigator. Results from the expedition will also provide crucial information for the management of the Galapagos Marine Reserve (GMR), a UNESCO world heritage site. Seamounts were teeming with fish and marine invertebrate life, including many species of economic importance for the archipelago, and many new potential records for the GMR. One of the highlights of the expedition could be the discovery of a new species of catshark. Video surveys showed rich and diverse communities dominated by deep-water hard corals, soft corals like gorgonians, and a number of encrusting and vase sponges. Funding for this project was provided by the Dalio Explore Fund to WHOI. CDF was supported by a grant from the Leona M. and Harry B. Helmsley Charitable Trust. The researchers are grateful to the Galapagos National Park Directorate and INOCAR for their support. 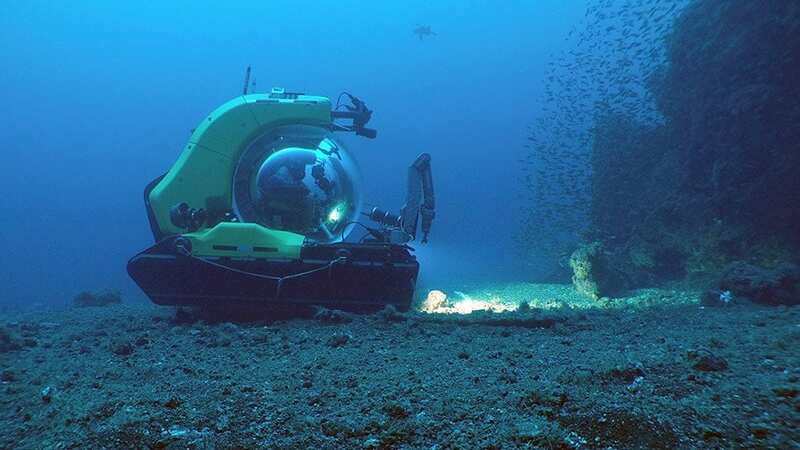 The Deep Rover 2 submersible sampling volcanic rocks at 150 meters depth during a dive at a seamount near Santiago Island, Galápagos. The image was taken during a joint expedition between Woods Hole Oceanographic Institution, the Charles Darwin Foundation, and the Galapagos National Park Directorate. Submarine lava tube and pillows at ~700 m depth offshore Fernandina Island, Galápagos on a small seamount on the southern flank of the island. The lava tube hosts soft and hard corals, sponges, gorgonians, feather starfish, bivalves and anemones. 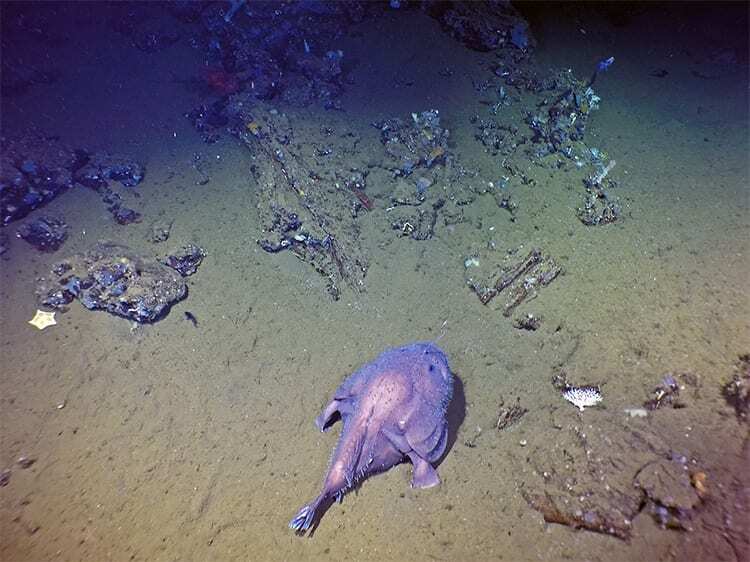 A large (~50 cm long) deep-sea angler fish among lava talus and sediment on the slope of a small seamount off the southern coast of Fernandina Island, Galápagos at ~600 m depth. Until recently, the Galápagos platform and the surrounding deep-water seamounts had not been explored using modern, high-resolution survey and sampling methods. The team utilized a multibeam sonar system mounted on Alucia’s hull and a side-scan sonar on a REMUS 600. The bathymetry comparison above is from an area south of Floreana Island, Galápagos . The top image is pre-cruise bathymetry with a resolution of ~1km per pixel. 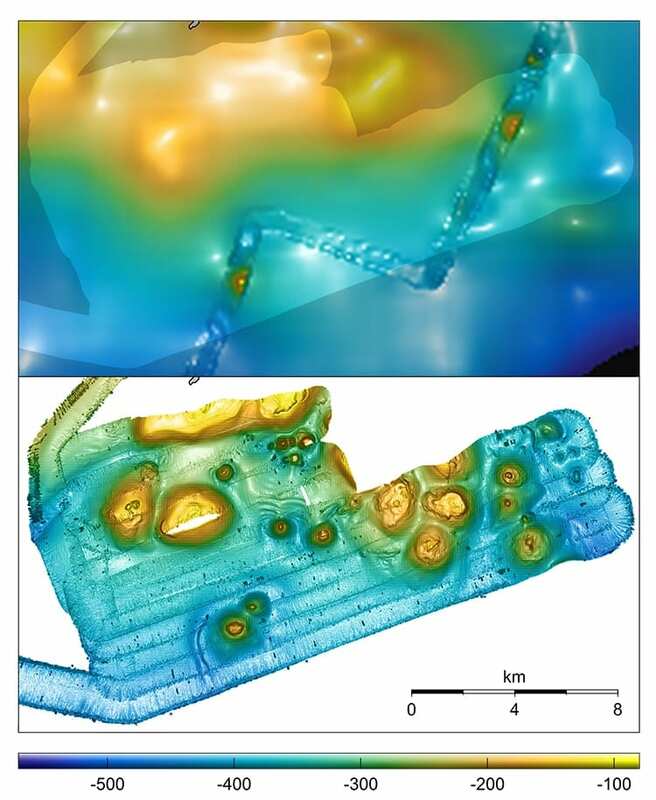 The bottom image shows bathymetry that was mapped during the August expedition with a resolution of 10m per pixel —2 orders of magnitude difference.